Ladies and Gentlemen, the year 2008 rapidly approaches. With it comes windsurfing season. Are you ready for a trip to Corpus Christi in March? If not, now is the time to start preparing. Early indications suggest we might visit sometime during spring break (March 8-16). I hope to see you all then! 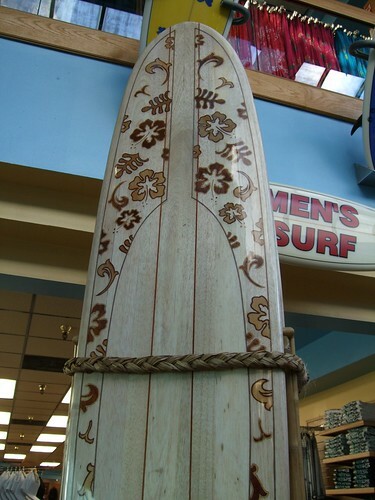 I found myself at the Ron Jon Surf School in Cocoa Beach, Florida this past Sunday. I bet you're wondering: "Surfing? Not windsurfing?" You might also think that I would already know how to surf, seeing as how I can windsurf. Not so. Surfing and windsurfing may sound like they should be closely related, but they are more like cousins. The philosophies behind them don't match. One activity is powered by wind, the other is powered by waves and a bit of paddling. There is definitely some cross-over between the two, but surfing requires many new skills techniques. Amy and Missy taught James, Ed, Chad, Jolyon, and I the surfing basics. Class started out with a quick safety lesson describing the various hazards surfers face: riptides, stingrays, the sun, jellyfish, shallow water, and the dreaded Portuguese Man O' War. Since we were not frightened away by the dangers, Missy and Amy moved on to teach us the pop-up. The pop-up maneuver gets you from laying on your belly to standing on the board. We practiced this on the floor of the school's office. After we all made fun of each other for lying on our bellies, paddling carpet, and performing pop-ups, we moved on to the beach. There, we slithered into our wetsuits, smeared on some sunscreen, and carried the boards to the beach. We learned another curious difference from windsurfing: the leash. 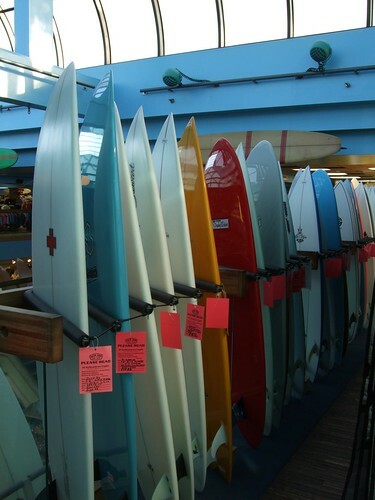 Each of the boards had a leash with an ankle strap to keep the board and rider attached to each other. This makes sense, although the leashed board tends to follow the rider like an over-exuberant puppy. Out in waist-deep water, we lined up and laid on our bellies waiting to get launched into a wave by Amy or Missy. One, two, three, a push, and an attempted pop-up. Like learning to ride a bike, most of us fell for the first few tries before starting to get the hang of it. Despite the high risk of falling, getting up on the board feels great. There is definitely something new about standing on a board and moving without a sail. Once we started getting the hang of standing on the boards, we moved on to paddling for the waves rather than relying on a push. For this to work, now we had to judge the waves, start paddling soon enough to match their speed, and sense when to pop-up on our own. Once we all managed to catch a few of our own waves, it became a case of practice makes perfect. Even if you're a hard-core windsurfer, I strongly suggest taking a surfing class. You have to have something to do on those light wind days, right? Surfing -- at least with a long board -- doesn't seem to require huge surf. We were surfing in one to one and a half foot waves. Even small boat wake might do the trick. Also, there are lots of interesting advantages to surfing over windsurfing. Compared to windsurfing, you definitely need less equipment. The only really necessary surfing equipment is the board. As much as I enjoy windsurfing, it does require a certain level of planning to avoid forgetting a key piece of equipment. Don't forget the board, the fin, a sail, a matching mast, a screwdriver, electrical tape, a harness, the boom, and so on. The difference isn't a huge deal, but I could see squeezing in a one hour surf session. Packing, assembling, and disassembling a windsurfer would easily eat up much of that time. And, of course, more equipment just makes for a more expensive sport. Windsurfing has its advantages too, of course. You generally spend more time actually up on the board when windsurfing. I suspect that you can go faster on a windsurfer than the average surfer will ever get on a wave. If speed motivates you, a windy day and a windsurfer might make you happier. 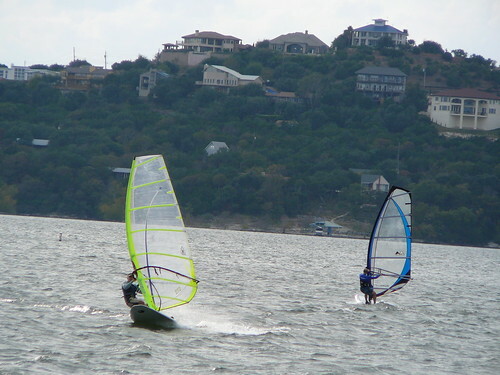 Windsurfing also lets you go places. I'm not an expert, but I don't think most surfers use their boards to explore. Of course, most windsurfing fanatics just go back and forth anyhow, so you might call this a technicality. Windsurfing also involves all this cool equipment that you can tweak and tune -- equipment geeks definitely will like all the stuff that you can play with and use for tricks. Despite these differences, surfing and windsurfing are complementary. The balance and board control skills of both sports definitely overlap. Some of the stand up paddle boards even have mast tracks, which intrigues me. Naish has a stand up paddle board which looks cool as heck. It appears to make a decent light-wind sailboard too. To wrap up, we all had a blast. Learning to surf is a fantastic way to spend a few hours. Amy and Missy both showed us a great time as we learned. If you're in the Cocoa Beach area, visit them. I'm hooked; I definitely plan to surf again!